Must be delivered as a layered Photoshop (.PSD) file using the supplied template file. Production then readies the skin for deployment onto the site. All fonts must be delivered with the creative in Mac & PC format in case of necessary edits. A single click tag is available to be used with the skin. 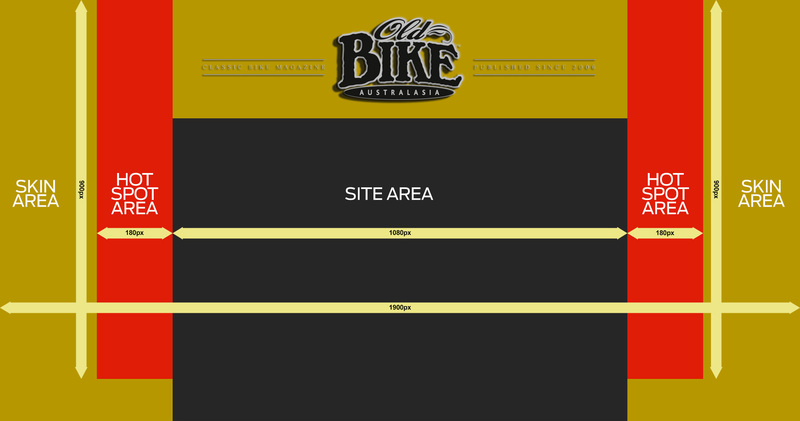 The skin allows an advertiser to take the place of the background on the Old Bike website and remains visible as the user scrolls down the website. The skin is best optimised for the target audience with a screen resolution of 1440 x 900 pixels and greater. Design of standard ad units may be used to integrate with the skin to maximise the campaign effectiveness. Main elements of the creative should display in the 180px on the left and right of the site (shown in red hotspot areas above). Other elements may be placed outside this area but whether or not they are seen by the user is dependent on their individual screen resolution. All skin elements indicated with yellow (including behind the Old Bike logo) must be designed for. Any creative placed behind the Old Bike logo must not interfere with the display or design of the logo. nextmedia reserves the right to modify or reject any creative that is deemed to conflict with the Old Bike logo branding. Please ensure the background of the skin covers the minimum dimensions above. All critical images/type should be placed within the red areas indicated. nextmedia requires that all creative be submitted one week prior to live date to allow for testing and approval. Please ensure that all specifications are met. Ads that do not meet all our specifications will be rejected, affecting the launch date of the campaign. If you have any further questions regarding campaign tracking for this placement, please contact your nextmedia representative.